GALVESTON ISLAND, TX-May 26, 1999-During the past two weeks, students at Weis Middle School have donated their extra coins towards a "Save Our Sub" campaign to raise funds for the USS Cavalla, which is berthed at Seawolf Park located on Pelican Island. 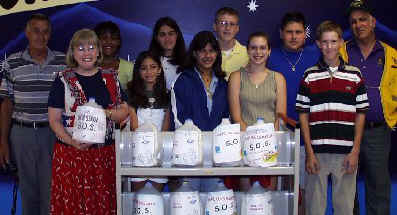 Fifteen milk jugs were placed throughout the school for donations from students and staff. The fund raising drive ended on the last day of school, Wednesday, May 26. Students presented $128 to representatives of the Cavalla Historical Foundation. The Foundation is working to restore the USS Cavalla which is the only full-size submarine on display in the State of Texas. Students from Weis Middle School present representatives from the Cavalla Historical Foundation with money raised for the World War II submarine, the USS Cavalla, which is berthed at Seawolf Park. Pictured from left to right, (back row) Richard Beeghly (Cavalla Historical Foundation), Principal Susan Swindle, students Briauna Bergland, Jennifer Kelley, Ryan Reeves, Daniel Schmid, Assistant Principal Connie W. Stewart and John Fredericks (Cavalla Historical Foundation). Front row pictured are 7th Grade Teacher Donna Karn; students Stephanie Lozano, Nicole Gutierrez, Jenna Beshears and Kevin McDonald.